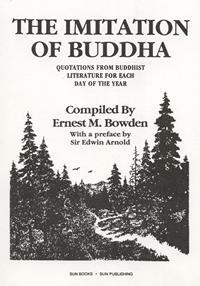 THE IMITATION OF BUDDHA - QUOTATlONS FROM BUDDHIST LITERATURE FOR EACH DAY OF THE YEAR Compiled by Ernest M. Bowden with preface by Sir Edwin Arnold. These 366 wonderful quotes are taken from a broad base of Buddhist Literature including many now hard-to-find texts. 146 pgs. 5x8. Paperback. ISBN: 0-89540-291-2. $10.00.